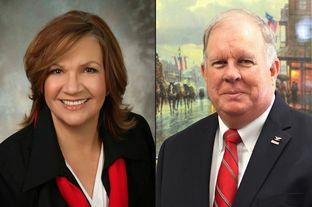 Challenger Hugh Shine secured victory Thursday in the Republican primary for Texas House District 55, defeating incumbent state Rep. Molly White by 104 votes after a recount, according to Bell County GOP chairwoman Nancy Boston. White announced last week that she would request the recount after trailing Shine by 118 votes on election night. Meanwhile, results in the other contest that remained uncertain after the March 1 primary — the second runoff spot in Senate District 1 — were still unsettled Thursday evening. Red Brown and state Rep. David Simpson, R-Longview, traded places intermittently throughout the week as results from provisional ballots across the district’s 16 counties came in. At various points on Thursday, each candidate appeared to have won by a handful of votes as they contended for a chance to face state Rep. Bryan Hughes, R-Mineola, in a runoff to replace retiring state Sen. Kevin Eltife, R-Tyler. Once official canvassed results are finalized, the third-place candidate will have the opportunity to request a recount. See here for the background. As Juanita put it, this was a contest between an ineffective bozo, and a regular Republican who can probably get stuff done. Which in this context may be a mixed blessing, though in the grand scheme of things it’s surely better. Congratulations to Rep.-elect Shine. That Senate race is a doozy. The Kilgore Herald News gives a fuller picture of its status. All the counties in Texas Senate District 1 have released revised vote tallies from the 2016 GOP Primary election. Canvassing is underway, but there’s still no clear verdict on who will face frontrunner Bryan Hughes in the May 24 run-off. It will definitely be either James “Red” Brown or David Simpson. It will definitely be by an extraordinarily narrow margin. It will almost-definitely take a recount to determine whose name is also on the ballot two months from now. With 298 precincts across 16 counties, there are (relatively) hard numbers from most of the district. However, multiple reports show a significant discrepancy in the numbers coming out of the area’s largest division, Smith County. It’s difficult right now to draw a firm conclusion absent a recount. From the best numbers available at press time, there were 133,413 votes cast in the race between early polling, Super Tuesday, provisional ballots and absentee decisions (including those from members of the military serving overseas). Incorporating the updated-but-uncertain figures, Hughes maintains his early lead. Giving up his Texas House District 5 seat to run for the senate post, the frontrunner still didn’t secure the 50 percent-plus-one he needed to win the race outright but kept his initial 47.99 percent share of the overall tally. Adding 179 additional votes after Monday’s late-deadline, he leaves primary polling with 64,023 ballots. Likewise, the outlook didn’t change for fourth place: Queen City candidate Mike Lee collected 12,630 votes by the time the polls closed on Super Tuesday and picked up an additional 23 this week. As of Thursday afternoon, his final count rests at 12,653, a little less than 9.5 percent of the total. Lee has since endorsed Simpson. As for the run-off, right now it looks to come down to one vote, according to the latest reports, and the new numbers have flipped the lead. From initial Super Tuesday returns, Simpson (two-term representative for House District 7) had a 13-vote lead over Brown, a Tyler-area businessman and major general in the Army National Guard. It was a miniscule margin, 0.01 percent among 133,037 early and election day votes reported online at the Texas Secretary of States election results portal. Updated data from 16 counties’ election officials trimmed and ultimately inverted the race for the number two spot in the run-off. By Thursday, there were no changes to the tallies from Upshur, Morris, Franklin, Rusk and Panola counties. Gregg County reported 15 provisional ballots in Simpson’s favor to 11 for Brown. Between Marion, Wood, Red River, Bowie, Camp, Harrison, Titus, Lamar and Cass counties, Simpson picked up another 22 votes to Brown’s 14. According to Smith County’s latest numbers online, each of the four candidates added a substantial number of ballots compared to other parts of the district. Notably, the smith-county.com total for the race shows a difference of 228 votes from the total reported to the state March 1. This, despite a March 8 press release noting the county’s ballot board accepted and counted 136 of 447 possible provisional ballots. “What we have on our website is the complete, unofficial final until this evening when we canvass,” Smith County Elections Administrator Karen Nelson said Thursday afternoon, noting an adjusted total of 48,202 votes there. Of those, 35,962 were cast in the senate race. From the 228 votes added to Super Tuesday’s total, Hughes picked up 111, Brown drew 66, Simpson collected 39 and Lee saw an additional 12. Those numbers put Brown at 28,369 votes to 28,368 for Simpson. In the past week, Simpson first cautiously and then more confidently laid claim to the run-off spot. As of Thursday, Brown is pushing the figures that give him a one-vote lead, crediting his campaign staffers’ research reflecting the same. Yowza. One stinking vote may be the difference between making the runoff or not making it. Every vote matters, y’all. For sure this one will go to a recount, and possibly to court after that. Thanks to Ed Sills for the link. The Current has more.